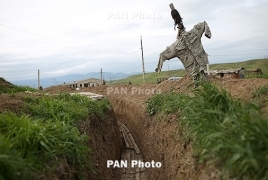 PanARMENIAN.Net - Azerbaijan on April 2, 2016 launched a large-scale military offensive against Karabakh, which claimed the lives of hundreds on both sides. Top Armenian and Azerbaijani defense ministers agreed a deal on the cessation of hostilities on April 5. In Azerbaijan’s aggression and war crimes, Armenian civilians, including a child were killed, several soldiers were beheaded, while the bodies of all the captured servicemen were returned with signs of torture and mutilation. On the night of April 1-2, Azeris carried out rocket and artillery strikes, targeting not only on Armenian military units, but also civilian settlements. On April 2, the rival used BM-21 Grad multiple rocket launcher in the Martuni direction of the contact line. 12-year-old Vaghinak Grigoryan was killed in the shelling, two more children were wounded. Other civilian casualties were also registered alongside the combat losses that the Karabakh army sustained in the April war. Kyaram Sloyan, a Karabakh Defense Army soldier, was killed during the clashes and beheaded afterwards. Videos and pictures were later posted online, showing Azeri soldiers posing with Sloyan’s severed head. Besides Sloyan, at least two more Karabakh soldiers - Hrant Gharibyan and Hayk Toroyan - were beheaded. In late June 2016, Karabakh’s Prosecutor’s Office declared that one of the Armenian soldiers killed by Azerbaijani troops during the 4-day war was decapitated while still alive. Karabakh's State Commission on Prisoners of War, Hostages and Missing Persons on April 10 exchanged bodies of fallen soldiers with the Azerbaijani side. The exchange was organized in accordance with an agreement, previously reached between Karabakh and Azerbaijan through the mediation of the International Committee of the Red Cross (ICRC) and the Personal Representative of the OSCE Chairperson-in-Office, Karabakh Foreign Ministry said, providing no other details. The bodies of 18 servicemen of Karabakh Defense Army were transferred to the Karabakh side. In the presence of a representative of the International Committee of the Red Cross, the Commission registered that all bodies transferred by the Azerbaijani side had signs of torture and mutilation. “Those acts, being a flagrant manifestation of inhumanity, run counter to the laws and customs of war and are in grave violation of the international humanitarian law, in particular, the Convention (I) for the Amelioration of the Condition of the Wounded and Sick in Armed Forces in the Field (1949), Geneva Convention (III) relative to the Treatment of Prisoners of War (1949) and the Additional Protocol to the Geneva Conventions of 12 August 1949 relating to the Protection of Victims of International Armed Conflicts (Protocol I),” the Commission said in a statement back then. Meanwhile, no traces of abuse were found on bodies of Azeri soldiers returned by Karabakh. Before the start of the exchange procedure, all bodies were examined in the presence of representatives of the International Committee of the Red Cross. No traces of abuse or ill-treatment were discovered or registered on the bodies of Azerbaijani soldiers.